This book offers a fascinating and insightful overview of seven centuries of murder in Europe. It tells the story of the changing face of violence and documents the long-term decline in the incidence of homicide. From medieval vendettas to stylised duels, from the crime passionel of the modern period right up to recent public anxieties about serial killings and underworld assassinations, the book offers a richly illustrated account of murder’s metamorphoses. Pieter Spierenburg is Professor of Historical Criminology at Erasmus University Rotterdam. "A fascinating story about the control of private aggressive urges over seven centuries." "A remarkable achievement in drawing together an unusually broad and cross-cultural collection of materials, summarizing a complex field and offering a strong and coherent statement about the causes and contexts of historical changes in violent behavior." "Engaging, well informed, and laden with insight." "News addicts may be forgiven for thinking that we live in a time of unprecedented violence, but this book, intended for a general audience as well as scholars, proves them wrong ... Spierenburg does an admirable job of outlining these trends and many other facets of violence." "Spierenburg synthesises a tremendous amount of data to put forth a fascinating overview of the history of murder." "A powerful work [which] should help us to better understand past and present patterns of violence, culture and power." "Spierenburg achieves success in [his] difficult task through a combination of elements: the hypothesis is clear and simple, individual cases are well chosen and well narrated, space is given to rival interpretations, and differences between scholars are clearly articulated and evidence is fielded on one side or the other." 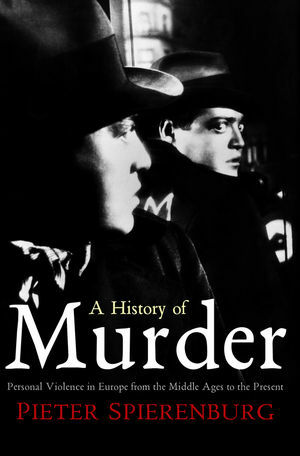 "The broad sweep of A History of Murder, coupled with its accessible style, makes it an invaluable resource for researchers and teachers of crime history and criminology." "In A History of Murder one of the leading scholars of the subject provides in highly readable form the first thorough account of its changing patterns in Europe from the Middle Ages to our era. This work dispels many long-standing myths and fallacies, and puts in their place measured conclusions based on the most up-to-date research. The book provides a fascinating and accessible supplement to standard surveys of European history and essential historical context for the study of homicide and criminal violence today." "Few would attempt to chart the pattern of homicide across Western Europe since the late Middle Ages; fewer still could carry it off as well as Pieter Spierenburg. He ranges widely across personal relationships, rituals, concepts of honour, and the growth of the state, as well as shifting attitudes to violence and homicide. He presents stimulating arguments about the development of modern society and about violence that merit careful consideration and deserve a wide audience." "This book is a triumph. Pieter Spierenburg has used his own research and others' to illumine the history of murder in the western world over many centuries, combining familiar literary sources with unfamiliar criminal statistics in ways that should appeal to scholars and general readers alike."